The HC-OE120-16E1 is a fiber media transmission for 16×E1/G.703. It provides one EOW and one RS-232Cdata port added with both AC and DC power supply. For the E1 port, there are two models of connector. The DB37-CC4B-8G model provides unbalanced 75 Ω connections while the RJ45 model provides balanced 120 Ω connections over twisted pair wire. 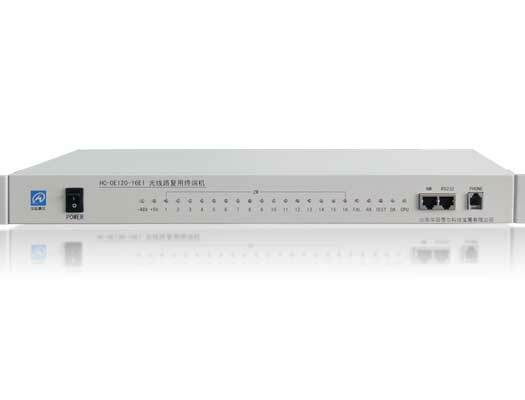 For the optical port, it can provide multi-mode or single-mode optical transceivers. Using different optical transceivers, the data can be transmitted from 20Km up to 120Km. RS232 console port for an ASCII terminal. Data format: 9600bps, 8-bit data, 1-bit stop flag. Function: software upgrade, loop configuration, status monitoring.